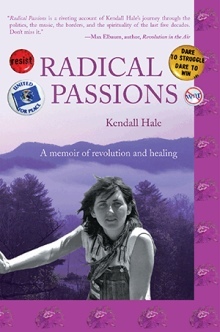 Eleven years ago, in 2007, I wrote the last words of my book, Radical Passions: A Memoir of Revolution and Healing. I concluded with a vibration of hope and light. But in 2018, our country no longer looks or feels the same to me. Obama’s charismatic campaign of “Change We Can Believe In” did win the presidency but was quickly darkened by neo-liberals seduced into right wing free market ideology exploding his dream into a pit of financial ruin for a majority of Americans, a weak response to climate change and a reckless foreign policy. The rich got richer, the rest of us got much less and a great deal angrier, and the climate/earth got hotter. My daughter and son grew up alongside young rebels challenging the decline of democracy. My husband and I both followed and led protests into utility rate hike hearings and into the streets and hills from Occupy Wall Street to Standing Rock, and the Poor Peoples Campaign. Deepening injustice fueled our collective fury into breaking up shareholder meetings, disrupting regulatory hearings, walking hundreds of miles in marches, picketing and blockading banks, the NC legislature and federal agencies. We fought fossil fuels everywhere: oil rigs, coal, tar sands and natural gas pipelines. Wave after wave of elders and youth, gay, lesbian, transgender, Black Lives Matter, Dreamers, Women, #Me Too, Service Workers, the Working Poor, and Teachers and Students all woke up from the nightmare. They began truth telling daily on social media, exposing Koch Brother-National Rifle Association funded elites, corporations, lobbyists and politicians running Washington DC. Then, Bernie Sanders lost. We didn’t get a woman president. Trump won. Many people got depressed, sick, retired, lost jobs, became addicts or died. The guns kept killing abroad and at home until Florida students who were attacked in their high school by a home grown, white, male terrorist with an assault weapon, mobilized to stop the cycle of gun madness. At the same time, Asheville, NC became a tourist heaven with craft beer companies, hotel chains, gourmet food, outdoor sports, spas and alternative medicine. Yet in Fairview, Sharon Spring flourished with new life. I created a guest cabin visited by folks from all over, who enjoy a hot tub, yoga classes, massage therapy, a wood burning sauna, a vegetable and water garden. Ancient mountain energy surrounds our property of 20 acres teaming with meadow creatures: cows, chickens, honey bees, insects, snakes, birds, flowers and trees. An underground spring filled our pond, sustaining healthy aquatic life, summer swimmers and winter ice skaters. Our daughter, a creative writer, got married beside this pond under a weeping willow tree, moved into our old renovated tobacco barn, and birthed a heavenly star-bright baby girl. Her uncle, our son, is now employed in the solar power revolution. And thankfully, his brilliant determination and our granddaughter’s breath-taking innocent glow is burning brighter than the toxic sickness eroding our American democracy. Deborah Woolley, 2013 Walk For Our Grandchildren: Keep Fossil Fuels In the Ground. Discover Radical Passions by reading more about the book, viewing photos & media, or by contacting Kendall Hale. Radical Passions is also available at your favorite book retailer.